Being from the northeast, I have a natural affinity for porches that are overflowing with flowers and pumpkins. Something about walking up to someone's door amidst an explosion of colors... it just seems so inviting! 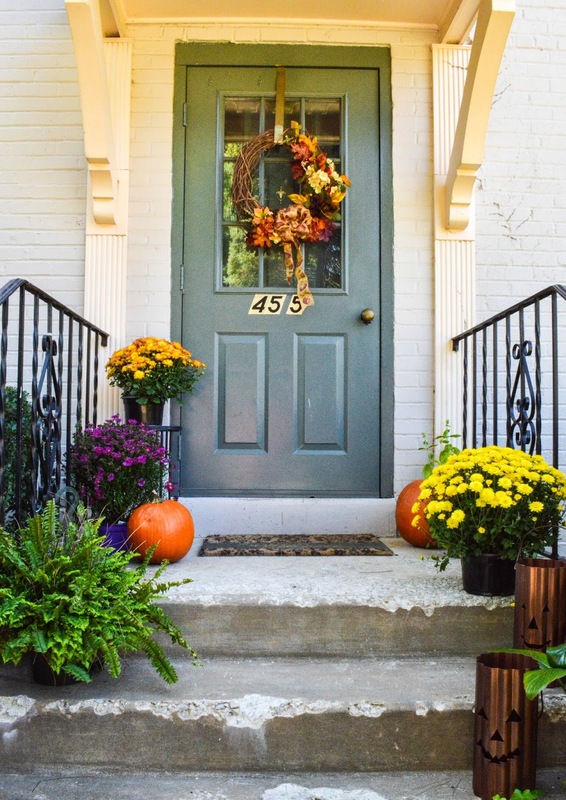 I'd actually like to do a little more with my tiny little front porch (Add fall flowers or greenery to my urn, find beautiful pots for my mums, maybe even incorporate some cornstalks from one of the local farms...) but for now, the message works: welcome, welcome, welcome fall!! 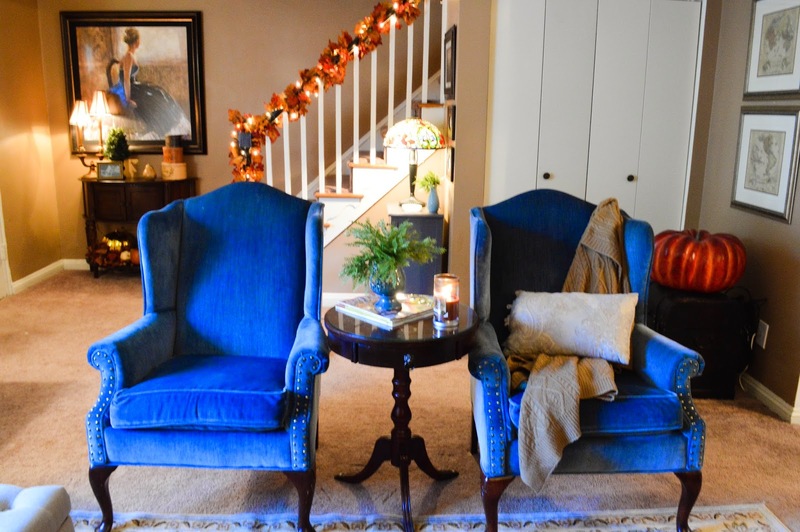 In the living room, the fireplace (not the tv) takes center stage. 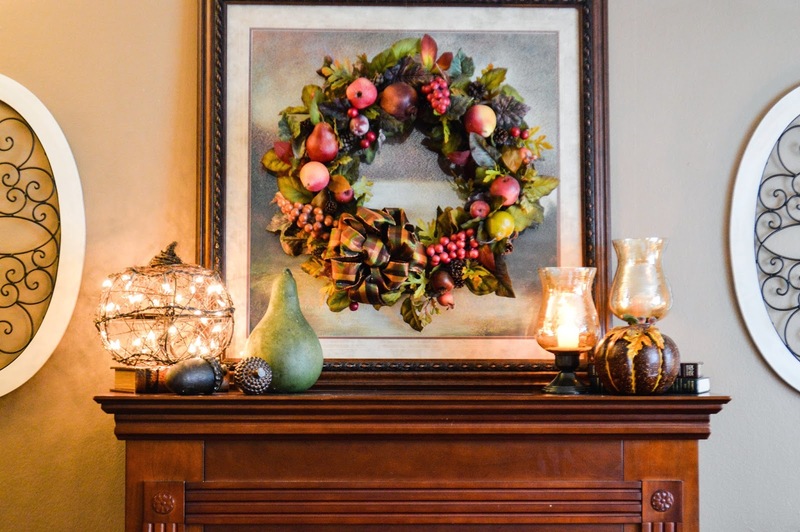 In addition to my Abundant Autumn Wreath, I added some oversize acorns, gourds, gold hurricanes and a grapevine pumpkin lit with white lights to warm the mantle. (You can also see the edges of the framed iron scroll art pieces I just bought. Originally $60 a piece, I got them both for $12! Some deals make you tempted to leave the tags on...). The stair railing has been wrapped in garlands of leaves and white lights, and my wonderful big, fat pumpkin was tucked into a corner on the steamer trunk. I also put out a few cozy throws to cuddle up in on chilly evenings. The console by the door is one of my favorite spots. I love the demilune shape, and the space below is such a wonderful place for unobtrusive but elegant tableaus. 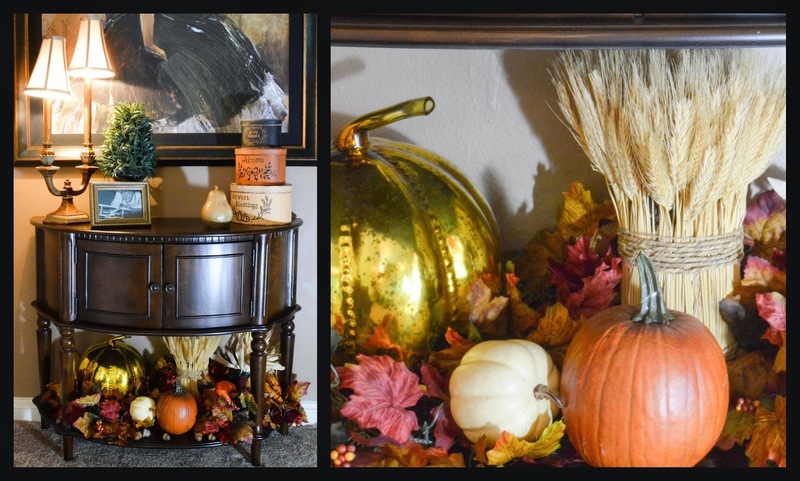 Going with the "abundance" theme, it's overflowing with leaves, white and orange pumpkins, a gold mercury glass pumpkin, acorns, Indian corn and wheat. The fact that I can get crazy with the bottom part means that I can leave the top relatively (note the word "relatively") clear for a tray of drinks when I have guests. The dining room and kitchen actually have a head start on my Halloween decorating. 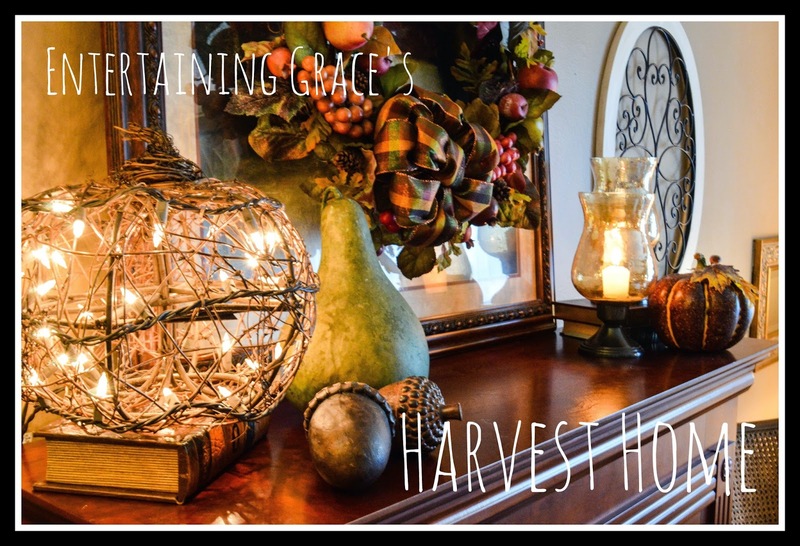 I imagine post-Halloween and pre-Thanksgiving, they'll take a turn back toward Harvest decor, but for now they're sporting a more ghostly garb. 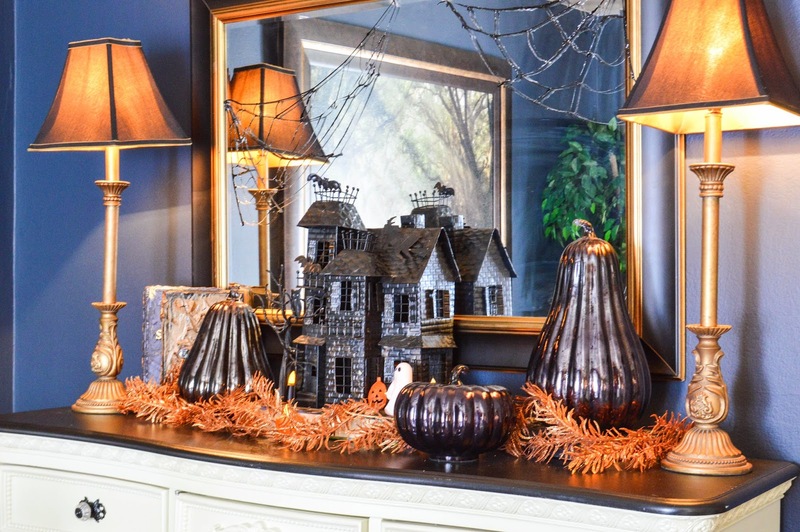 On the buffet is the Haunted House my husband I bought together 8 years ago, my DIY Spooky Halloween Books, DIY Puff Paint Spider Webs, burnt orange glitter garland and black glass pumpkins from Pottery Barn . Everyday new little touches are being added to corners, hallways and bedrooms: wooden ornaments, vases of sunflowers, a treasured bubble light. It's never really quite done. But that's the fun! If I know me (and we go back a few years), I'll probably sit with this for a few days and then tear it all down and start on Halloween. I love this season! Happy First Day of Fall Everybody!